Chicago Bulls shooting guard Ronnie Brewer is quiet off the court, but it&apos;s hard not to notice the former Arkansas Razorback on the hardwood. Whether it&apos;s his harass-you-like-Sallie-Mae defense or his ability to get to the rim on offense, anyone with a brain cell can see that Brewer can ball. We caught up with Brewer a few weeks back, to talk kicks, video games, the NBA lockout, and more. What&apos;s your song of the moment? Ronnie Brewer: "Marvin Gaye and Chardonnay." I&apos;m also jamming "Otis," too, and Lil Wayne&apos;s Sorry 4 the Wait. Ronnie Brewer: When I&apos;m not on the court in gym shoes, you can me find in all types of different color Air Force 1s, and some Js, too. What&apos;s the most money you&apos;ve ever spent on an item of clothing? 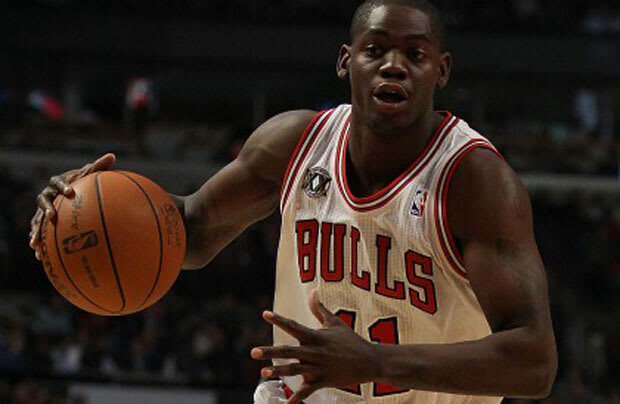 Ronnie Brewer: My rookie year in Utah, Coach Sloan had a rule about no jeans or tennis shoes. So I had to buy a lot of khakis, ties, blazers, and suits. So I&apos;ve bought suits ranging from $1,500 to $4,000. Ronnie Brewer: You always gotta have Halle Berry up in there, even though she&apos;s a little older. Then you have Beyonce, Ciara, and Mya. Oh yeah, Lolo Jones, the track star, she&apos;s got to be in there too. And basically anyone who is in the Sports Illustrated Swimsuit edition; all those girls are good looking. If you were a music exec, which two rappers would you pair for a supergroup? Ronnie Brewer: I&apos;d have to go with Lil Wayne and Jay-Z, Drake and Jay-Z, and Jay-Z and Eminem. Anybody with Jay-Z is a great album. What&apos;s your current video game obsession? Ronnie Brewer: I&apos;m on NCAA &apos;12 right now. Me and my friends have all-night battles, like nine or 10 games in a row. A best of three series turns into five, seven, nine, and so on. I try to play with a different team every time, but I consistently play with the Arkansas Razorbacks. Ronnie Brewer: A Bugattii or a Phantom—you know, something I&apos;d never buy. Maybe a Lambo or Ferarri, just outlandish cars you don&apos;t drive everyday. Ronnie Brewer: You won&apos;t ever see me without my Apple products. I always have my iPhone, iPad, and Macbook with me. What&apos;s the best thing about being a Chicago Bull? Ronnie Brewer: The history that comes with the organization and the great players before me. The fan support. The culture is diverse in Chicago, and it&apos;s a sports town. Who&apos;s the most famous person in your cell phone? Ronnie Brewer: All the teammates I&apos;ve played with along the way. There&apos;s Deron Williams, Chris Paul, Rudy Gay, D. Rose. No movie stars or nothing like that. What&apos;s up with your charity? Ronnie Brewer: I have the Ronnie Brewer Foundation. We had our first annual "Night with the Stars" in Fayetteville, Arkansas for the Boys and Girls Club down there. The goal was to raise money for a new gym for the kids. We also have a golf tournament on September 2. You can find out more on thebrewcrew1.com. Did you catch Kevin Durant&apos;s highlights from the Rucker a couple weeks ago? Ronnie Brewer: I got to NYC that Monday. I was supposed to go watch, but couldn&apos;t make it. I did make it out to Pro City on Tuesday. He dropped 41 that night and my teammate, John Lucas, put up 60 points. His Rucker highlights were pretty impressive. I wasn&apos;t surprised to see [Durant] put up those numbers. He&apos;s 6&apos;10" and plays like he&apos;s 6&apos;5". What are your thoughts on the lockout? Are we going to have a season? Ronnie Brewer: My teammates and I are very optimistic. Hopefully talks will speed up and get resovled like they did in the NFL. No one wants to miss an entire season. It&apos;s our livelihood and we just want to play. When they don&apos;t let us play, that&apos;s when guys go overseas. Is that something you&apos;d consider? Ronnie Brewer: My agent approached me about it. If it&apos;s an option and he finds the right situation for me, I&apos;d think about it. But right now, my main focus is the Chicago Bulls and trying to help us win a championship.